Following the Equinox axis of the seated figure of Bloxholm West brings us back to Temple Bruer...and the entrance to the Temple Farm / Preceptory complex....situated on Temple Lane. Where Temple lane meets Ermine street is a small triangular piece of land called the ‘Cocked hat’. 1. Associated with Nautical mapping and navigation. 2. Masonic and Knights templar references to initiation rituals. Knights Templar / Masonic initiations. A google search on Cocked Hat Templar Masonic associations brought umpteen references, here’s a taster to one linking it with the Royal Arch Degree. When worn by a male, it had its crest, comb, or point, set jutting forward; when worn by a female, it bore the same prominent part of the cap in reverse, or on the nape of the neck, as in the instance of the Amazon's helmet, displayed in all old sculptures, or that of Pallas-Athene, as exhibited in the figures of Minerva. The peak, pic, or point, of caps or hats (the term 'COCKED HAT’ is a case in point) all refer to the same idea. This point had a sanctifying meaning afterwards attributed to it, when it was called the christa, crista, or crest, which signifies a triumphal top, or tuft. Through mapping and navigation it’s possible that areas marked as ‘Cocked hats’ are references to landscape arrangements and as such a recognition to Gnosis being in the area. 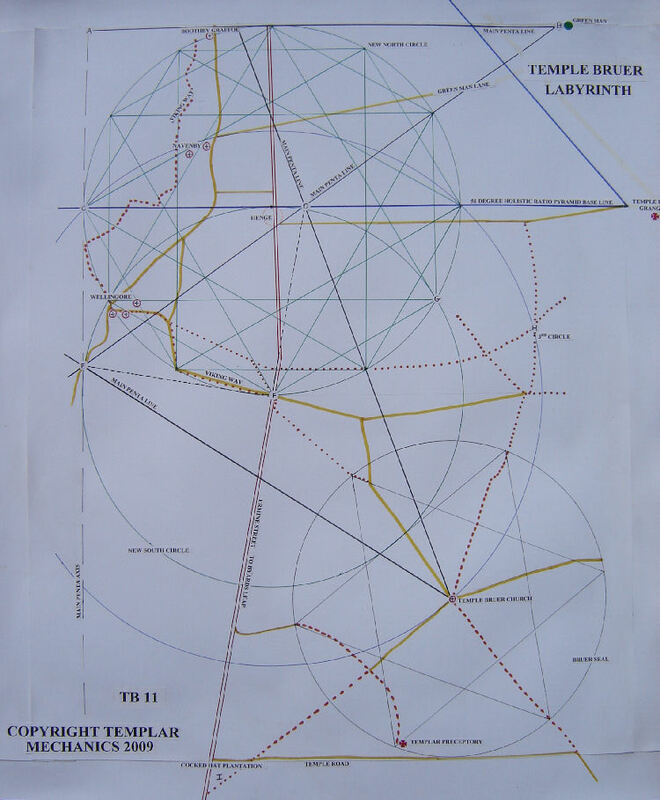 As detailed within the other articles of the Temple Bruer section of this web site ‘Cocked Hat’ is not the only navigational reference in the Temple Bruer area as we also have Francis Dashwood’s inland lighthouse sympathetically positioned within the geometrics. Its also been noted that many influential people from Lincolnshire met at the right arm of the pentacle marked by the Green Man Inn, where Dashwood ran another Knights of St Francis off shoot club called the Lincoln Club. One of its members was Lord Monson from the Great Carlton / Burton Hall estate just North of Lincoln, which is also very near to Ermine Street. Whilst researching all these ‘Cocked Hat’ connections I discovered an article on a web site that featured the Burton/ Monson estate....to my surprise another Cocked Hat had manifested there. The article was titled ‘The mystery of the Cocked Hat’ ! Could the cocked hat hold some in house meaning for the established families of the time and this is why they marked it on their estates? Another ‘Cocked Hat’ has turned up that was once part of the Panton Hall estate in the Lincolnshire wolds, approximately 15 miles East of Burton. A while back I was led to a book by Ralph Ellis titled ….’Thoth Architect of the Universe’. The book comes highly recommended as an inspiring source of hidden ancient wisdom. This publication has since become a continual source of reference in my quest to get as near to the ultimate universal truth as I can through the limited 5 senses…. temporarily entombed as I am in the human monkey suit with all its Earth based sensory restrictions. So what are the serendipitous winks and nudges of the ‘Cocked Hat’ near to Temple Bruer?…Is it’s uncanny position by accident or by intent? 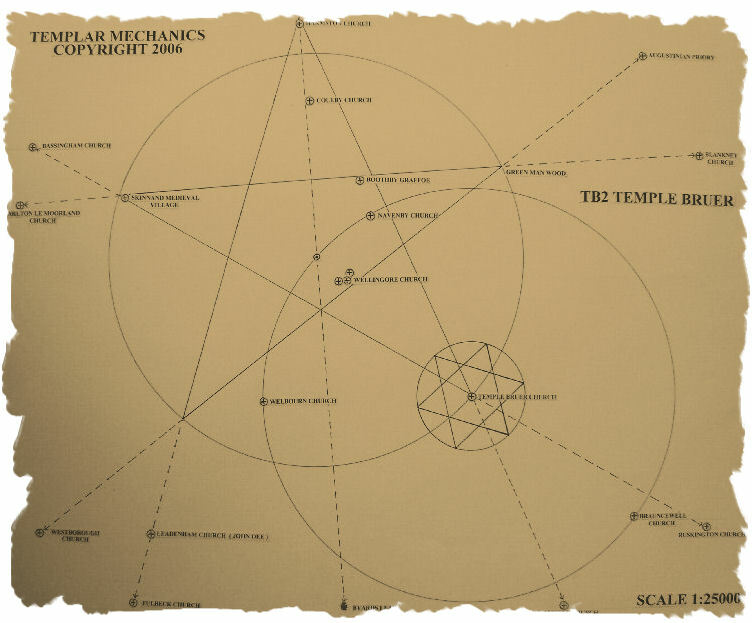 If you’ve followed the TM web site to date and made yourself familiar with the foundation geometry surrounding Temple Bruer you will be aware that certain tracks mark solstice sunrise and sunset positions….and the placing of Temple Bruer’s church looks to be intentional being at the meeting of 5 tracks or green lanes some of which may be ancient . You will also be aware of the Blankney influence in both the geometric layout of Bruer, land ownership and the structural development or physical manifestations of the site, resulting in sympathetic positioning of structures within the layout of the hamlet. Natural wells /springs along with buildings, roads and green lanes all seem uncannily in tune with the overall pattern on the ground…. Manifesting as a six pointed star within a circle. 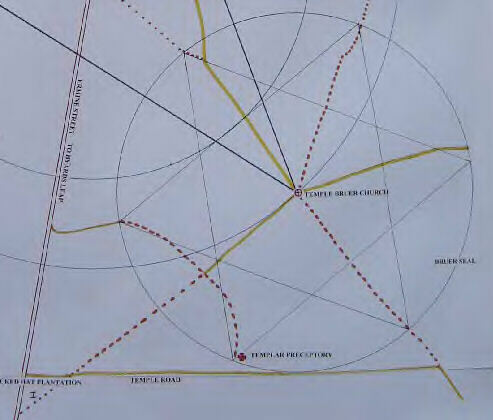 I8 local churches can be be aligned through the Temple Bruer hamlet and appear sympathetic to the geometric layout marking points and alignments. 18 churches can also be aligned through the centre point itself marked by the Temple Bruer church. It’s interesting to note Grand Masters of the Knights Templar were known as Nautoneers… a possible reference to mapping and navigation again? If ‘Cocked Hat’ is a mapping reference then what does it mean? Ralph Ellis describes the ‘Cocked Hat’ reference below from ‘Thoth , Architect of the Universe’…Once again I recommend this publication to anyone interested in the study. “Lines of equidistance are a standard method of finding the centre of any circle. Place two points anywhere on the perimeter of a circle, inscribe two arcs from each point with a compass, and a line drawn between the intersections will bisect the centre of the circle. 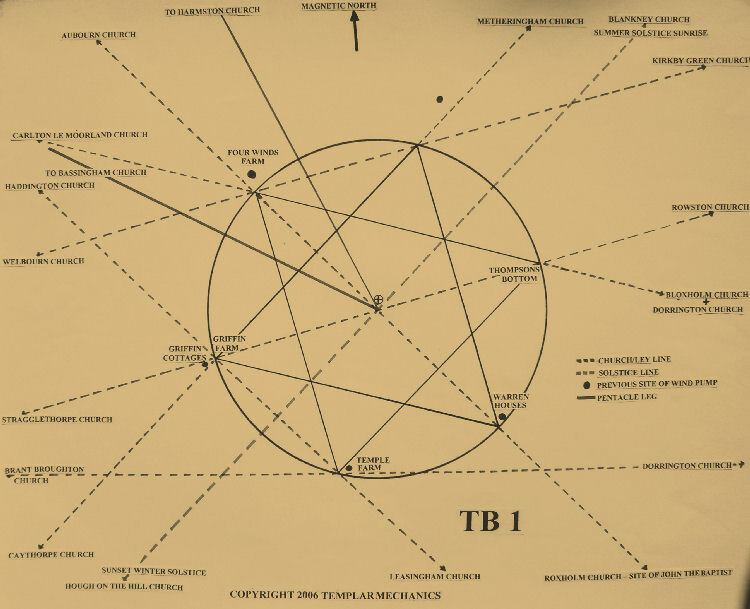 So a reference to circles and position, the ‘Cocked Hat’ within navigational terms appears to represent an area of uncertainty. To see if Temple Bruer’s ‘Cocked Hat’ position is by intent, whether through human or off planet influence, lets see what makes up the 3 sides of the Cocked Hat and if there are any pointers to intentional positioning or layout. Worth noting that mapping and navigation is about position and movement….which also marks passage of time as through movement time elapses / is measured……It could also be said that the suns position as viewed from Earth is a marker of time and position, hence many early seafarers used the sun position to work out their own position and the ‘time’ that had elapsed over distance covered...giving them a ‘speed’. So are there any connections at Bruers ‘Cocked Hat’ position to show what would appear to us as the suns changing position viewed from Earth…Is the Cocked Hat marking / noting significant points in the suns movements through the solar year ? 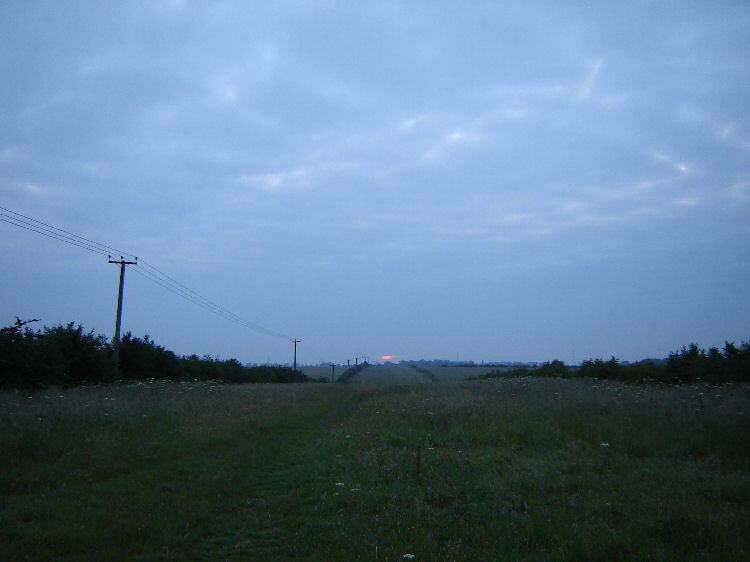 Last year I posted an article on TM showing the summer solstice sunrise and winter solstice sunset position marked by a green lane that runs from Temple Bruer church….I managed to gets some pictures of both magical events . 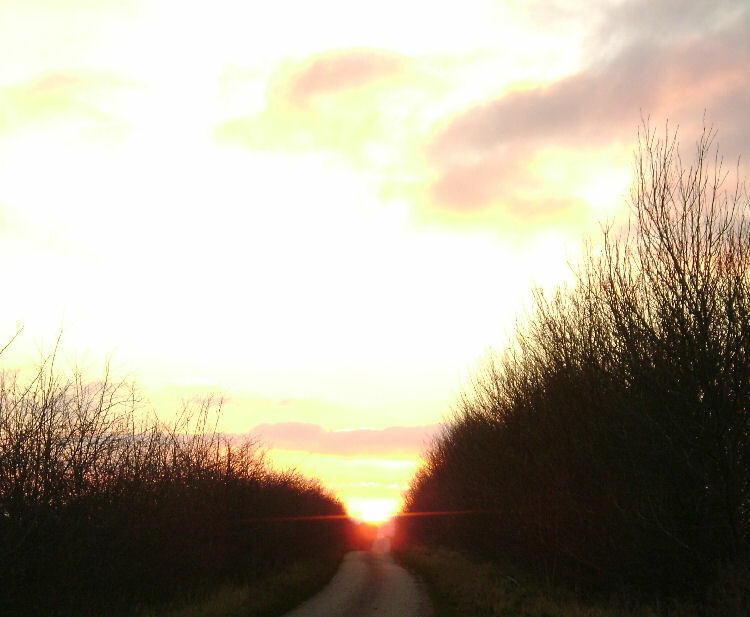 On the winter solstice at 15.51 the sun sets perfectly in line on the green lane leading from Temple Bruer church …This lane is marked at the point of the setting sun on the horizon by the Cocked Hat plantation. This winter solstice line marks one side of the Cocked hat as viewed from the Bruer church, which is also the main vortex of the Temple Bruer geometry where 5 lanes meet and 18 local churches align through…Its also situated at the end of the main Bruer pentacle leg. Incredibly this winter / summer solstice line perfectly splits the six pointed star down the middle marked by a green lane. Yellow lines mark established country lanes, Red dotted lines green lanes or tracks...quite incredible how they correlate/interact with the geometric 6 pointed star. The second side of the Cocked Hat is created by the great north roman road known as Ermine Street, which then continues up to the centre of Navenby Henge which was discovered recently by a local archaeology group……..see other articles in Bruer section off KT tab. The third side is marked by Temple lane that runs up to the main Temple Bruer complex…People would have travelled up from the south along Ermine Street and taken a right turn where the current Cocked Hat today is positioned, to get to the Templar preceptory. View from Equinox / Solstice line up Temple lane towards Templar Preceptory. The Temple lane section running from Ermine Street cross roads along the side of the Cocked Hat is aligned with the Equinox sunrise. From the corner of the Cocked hat at the ‘motorcycle point’ looking along the lane to Temple Bruer church marks the summer Solstice sunrise. Once the Cocked Hats Equinox side meets the solstice line at the motorcycle point it changes direction slightly for the approach up to the entrance to Temple Bruer preceptory. There will be a reason for this that is yet to be discovered, the fact that the Equinox side is on Temple Lane that leads to the Templar tower will be significant though. The Navenby Henge geometry, just a tad further North along Ermine street works due to the precious kink in the road just up from the vesica centre of the Bruer 5.151 system. Pictures from the Cocked Hat below. Ermine Street looking North from the Cocked Hat / Temple lane crossroads. Ermine Street looking South from the Cocked Hat / temple lane crossroads.